I’ve been working with investors and retirees for about 20 years now, and when they come to me, many are worried they will run out of money. In fact, many fear they will give up and have to go back to work. What they really want is to have the ability to generate a consistent source of income without having to go out and get another job. The single, best way to generate income consistently is by selling options. By that I mean you can conservatively make about 3 ½% return each month no matter what direction the market is headed. Why don’t more people do it? Well, there’s a lot of myths out there when it comes to selling options, so let’s just debunk a few right now. Myth #1 – Options Are Risky! This myth is spread through TV and movies and not based on reality. It’s like saying using a pair of scissors is risky. Sure, if you swing scissors around recklessly, that’s a problem. However, has that stopped you from using scissors? Do most people know how to use scissors correctly? Definitely. The same can be said about options. Options were actually created to reduce risk. And when you sell options correctly, you will always be protected, so your losses will be minimal. Plus, you will find you end up with between 70-80% winning trades. Myth #2 – I need a lot of money to sell options! Most people associate options trading with professional traders or other big wigs. In reality, very little capital is required to trade options. I focus on selling options to generate income, and the way I do it does not require a huge trading account. For example, I started a real-money trading account to demonstrate to my clients how they can trade using a small account. The most I’ve risked at any one time is $8,000 and that account has averaged 3.5% per month of income. Myth #3 – If I sell options, I’m going to get assigned the stock! This is one of the biggest fears I hear from people before they start trading options. In my 20 years of trading and thousands of option trades, I have never been assigned. That’s right. Never. The reason I never get assigned is because I never hold an option trade until expiration. As long as you follow a few basic management rules, you never have to worry about getting assigned either. Myth #4 – Options trading is difficult! Let me start by saying this. My teammate, Brian, told me he spent a little time with his 14-year-old daughter, and she is now able to set-up option trades. If she can do it, I’m confident you can do it too. A lot of places bombard you with information. In reality, you only need to know a fraction of it to be successful. Myth #5 – It will take a lot of time! I think people believe this myth because they are buried with information on options…the terminology, the different trades, etc. It makes it seem overwhelming and that it will take a lot of time. In reality, finding, setting-up and placing a weekly income trade can take as little as 15 minutes. Then, it just takes 5 minutes a day to check on it. Over the last 20 years, I bet I’ve made every mistake possible when it comes to trading options. The good news is, I now know how to avoid them. 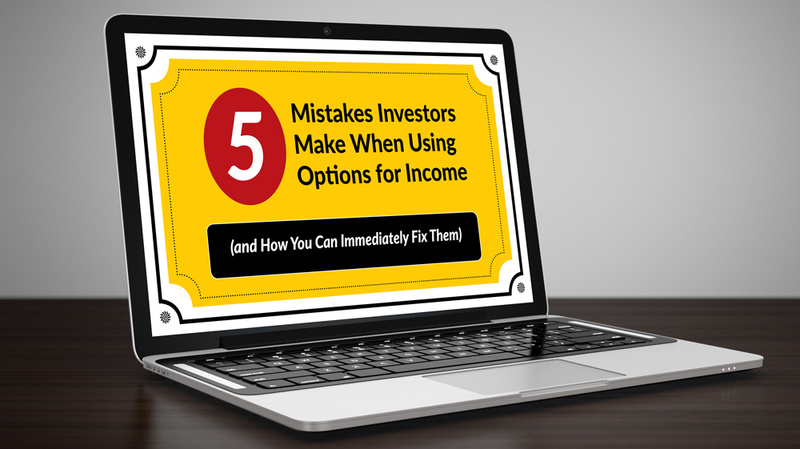 I want to share some of the biggest mistakes investors make with options, along with specific techniques to help you start benefiting from options and generating some income. Think about it this way. A stock can do one of three things. Let’s say you buy a stock or a call option. In order to make money, that stock needs to go up. That means you can only make money in one of the three scenarios. Which also means the SELLER of the option would make money in two of the three scenarios! There are three main parts of options to talk about right now. All three benefit the SELLER. » Key Takeaway: Being an option seller gives you a higher probability for success. I’m not saying you should just go out there and sell any option and money will just fly into your bank account. One of the best baseball players of all time was Tony Gwynn. Not because he hit a lot of home runs. But because he got a lot of singles and doubles. When you always try to hit a home run, most times you swing and miss and then strike out. Most option traders are the same way. They buy cheap options, hoping to hit a home run. What ends up happening is they suffer small loss after small loss, eventually draining their portfolio. To get these cheap options, they buy an option with a strike price that is really far away from the stock’s price. In order to make money, most times, the stock would need to make a significant move in their direction. Instead of buying those options, you want to be the seller. » Key Takeaway: Pick a strike that has a low probability of getting hit and sell it. Don’t treat options trading like the lottery. You don’t want to buy cheap options, hoping to strike it rich…only to lose most of the time. Instead, sell those options and become the Tony Gwynn of option trading. Make single after single, and you’ll generate very steady income. Another way to think of it…let other people be the gambler while you be the casino. Another way option buyers get cheap options is by selecting expiration dates that are too close. Those options are like meat on the discount rack. It’s cheap for a reason…because they will go bad very soon. An option with 180 days left until expiration will lose 50% of its value in the first 135 days and the other 50% of its value in the remaining 45 days. » Key Takeaway: Options decay quickly in the last 45 days. Sell options with an expiration date in that window. Let the buyers do the hoping and praying, while you collect little mini deposits each day as the option decays. No, it’s not what you might think. It has to do with selling options safely. If you sell options “naked” (yes that is a real term), then you take on more risk. That’s NOT what you should do. When you sell an option “naked,” that means there is no other trade along with it to protect it. Instead of selling an option “naked,” you should buy an option along with it as a way to protect it (and you) and limit your risk. Think of it like an insurance policy. This type of trade is called a credit spread, and it is an amazing way to generate consistent cash while limiting your risk. » Key Takeaway: A credit spread has a built-in protection plan. Protecting and growing your nest egg is all about low risk trades that have a high probability of winning. One of the worst feelings is to watch a profitable trade turn around on you and eventually close it for a loss. The great thing about credit spreads is they have a predefined maximum profit. Knowing that, you are able to set a pre-defined level of what would make you happy on that trade. Going for the full 100% is just pure greed, and you’ll get burned more times than it will work out. » Key Takeaway: Set your profit target immediately after you enter your trade. By placing your profit target order, you eliminate greed, and you can walk away with a profit you are happy with. Remember, generating income is something that you’ll always need to do. Many try to do it the slow way and put their money in the bank, mutual funds or dividend paying stocks. While you may grow your account, it will never be at the pace to make you feel comfortable. Others go for the home run and strike out a lot because they make all the mistakes above. The way you generate safe, reliable income is by avoiding those mistakes by using a simple, step-by-step system to find, set-up and manage your trades.